Tired of the same Thanksgiving turkey and Christmas ham recipes every year? 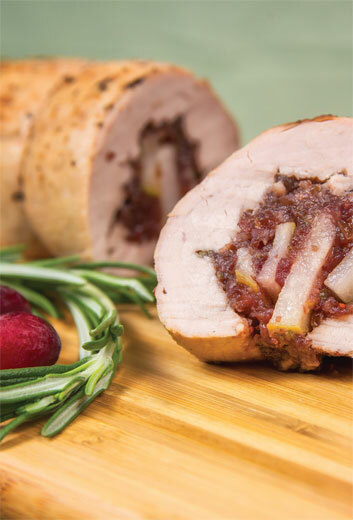 With its mix of sweet, earthy, and tart flavors and mild hint of heat, this stuffed pork tenderloin will charm relatives and impress guests. Try the filling with chicken, duck, or on its own with pita chips. Butterflying the tenderloin isn’t as intimidating as it sounds. Starting in the center of one side of the tenderloin, make a lengthwise horizontal incision, stopping about a half inch short of going all the way through. Then open the tenderloin as you would a book. Cover it with plastic wrap and pound until it’s about a quarter inch thick. Heat the oven to 425°F. Bring 2 cups of water to a boil in a medium saucepan. Add the cranberries and remove from the heat. Let stand about 45 minutes until plump and soft, and then drain. In a food processor, pulse the cranberries, shallots, honey, and juice until coarsely chopped. Mix in the red pepper flakes and rosemary. Spread the cranberry mixture down the center of the butterflied tenderloin, leaving a 1-inch border around the perimeter. Arrange the sliced pears on top of the cranberry spread. Starting with a long side, roll up the tenderloin. Roast for about 25 to 30 minutes or until an instantread thermometer inserted into the thickest part reads 145°F. Remove from the oven and let rest 6-9 minutes. Slice crosswise into 1 to 1 ½-inch pieces and serve. 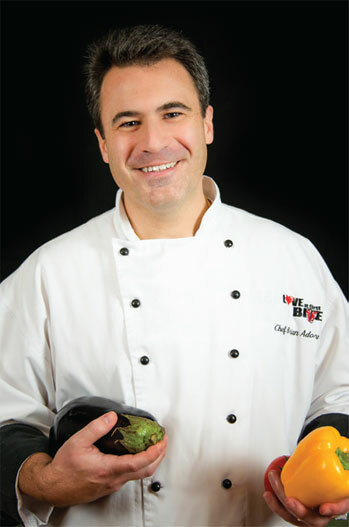 Brian Adornetto is a formally trained veteran chef, food writer, culinary instructor, recipe developer and discerning competition and cookbook judge. He has cooked in award winning restaurants and hotels and twice at the James Beard House.